Thoughtful Media Group’s network of online video Creators has smashed through the 100 million views per month barrier for the first time, up from 75 million during the last quarter. About 103.5 million people watched Thoughtful videos in Thailand in June, as reported by Google Analytics. Thoughtful Media Group’s network of online video Creators has smashed through the 100 million views per month barrier for the first time, up from 75 million during the last quarter, according to Google. About 103.5 million people watched Thoughtful videos in Thailand in June, as reported by Google Analytics, a remarkable achievement for the U.S.-based company’s nascent Bangkok office, only now entering its sixth month of full operations. Thoughtful’s Thai network now was 383 Creator channels, up from 338 in the last quarter, making it by far the largest international multi-channel network (MCN) operating in the market&mdashand more than twice the size of its nearest competitor. Channel growth strategy has focused on quality in recent months, with the company’s talent development team focused on recruiting the brightest and best YouTube talent in the kingdom. This growth has solidified Thoughtful’s position as the the leading MCN in that country. “Thailand growth has exceeded expectations in the first half of this year, which is particularly gratifying given the sluggish growth in the overall economy. But as we saw in the recent YouTube FanFest we co-hosted, the screaming and cheering local fans testified to the power and influence of the medium in the country,” said Mark Ingrouille, Thoughtful’s Executive Vice President for International Operations. The success of Thoughtful’s marketing campaigns for companies like Lionsgate, Worldfoods and Huawei, promoted through the company’s growing Creator base, has encouraged more brands to look for opportunities in Thailand’s online video market, such as The Face Shop, a South Korean beauty retailer with over 300 outlets in Thailand and a leading fashion title, German-owned Lisa magazine. Other new clients include the Freeland Foundation, Pacific Health Care, Mazda cars, Nestlé Thailand and even the Thai government, which has engaged Thoughtful for the first time to promote a major initiative in the agricultural sector. Alongside the growth in views, the company is expanding its management team in Southeast Asia. 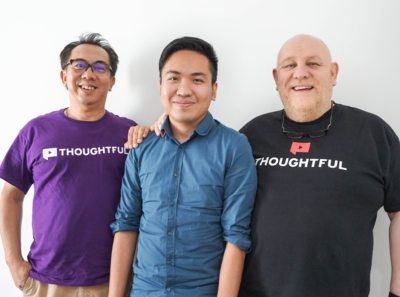 Danny Dung has become the first full team member of Thoughtful Vietnam based in Ho Chi Minh City. As Talent Manager for the territory, he will be responsible for leading the network’s growth and developing on-the-ground relationships as Thoughtful Media Group readies for a full office presence in Vietnam within the next couple of months. Until now, the network’s growth has been managed by the company’s Los Angeles headquarters. Thoughtful has 330 Creators in Vietnam currently, delivering 60 million monthly views, up from 50 million in the last quarter. For the past six months, Mr. Dung worked with the team in Los Angeles while he completed an MBA program at California State University. “It’s great to be home in Vietnam. There’s much I miss about being in the U.S., but we have an exciting opportunity here. We’ve already set out our credentials as having the largest network in Vietnam. Now we can turn those credentials into real substance and start the dialogue with advertisers and creators on the ground, in the market. That’s a huge paradigm shift,” said Mr. Dung. Photo caption: Danny Dung (center) with Thoughtful Media Group’s Somyot Chairat, Managing Director, Thailand & Vietnam (left) and Dr. Mark Ingrouille EVP, International Operations (right).